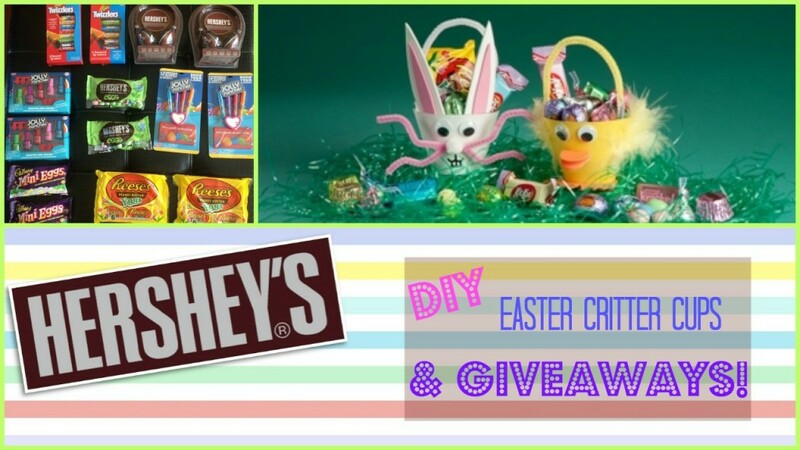 You are here: Home › DIY › HERSHEY’S DIY Easter Critter Cups & GIVEAWAYS!!! If you are looking for some fun easy crafts to do with your kids for Easter, try these Easter Critter Cups. In addition to the huge variety of chocolates and candies that Hershey’s has to offer, they also have tons of candy themed products like apparel, bath and body, accessories, electronics and more. So get creative and fill up your kids Easter baskets with Hershy’s in mind. You can find licensed Hershey’s products at Walmart, Target, Claire’s, Dollar Tree, Its Subar, Dollar General, Cracker Barrel, Kohl’s, TJ Maxx, Shoe Show, Bon Ton & Big Lots. This video is also a giveaway for 2 sets of Hershey’s prize packs! You can enter via the Rafflecopter below!!! GOOD LUCK & HAPPY EASTER!!! 15 Responses to "HERSHEY’S DIY Easter Critter Cups & GIVEAWAYS!!!" what a fun giveaway and as always, I love your photos! The video was adorable…………cute cute girls. My ll time favorite is the chocolate covered marshmallow egg. I love the peanut butter eggs. My favorite is the Hershey’s Cookie’s & Creme!! awesome giveaway thanks for the chance to win. i am tony l smoaks on rafflecopter.